After seeing photos of the Museum of Ice Cream (MOIC) in LA & NYC flooding my social feeds, I was so thrilled to find out that they were going to open a location in my hometown, San Francisco. Those that know me well know that ice cream is one of my favorite treats to indulge in, in all its creamy and flavorful glory. So when my friend, Thy from ThyTime, invited me to go with her to the VIP preview event the weekend before opening day, I immediately said yes! I went to the Color Factory pop-up exhibit not too long before I attended the MOIC preview event, so I thought I knew exactly what to expect. But after catching myself feeling like a child again while playing carnival games in the Ring Toss Room, diving into the Sprinkle Pool, and on a sugar high the entire time from all the yummy ice cream tastings, I realized that co-creators of the MOIC, 25-year old Maryellis Bunn and 37-year old Manish Vora, created an experiential space that clearly skyrocketed above and beyond my expectations. Today I’m sharing a photo diary of my experience at this fun and interactive candy land. The people in our group were each given a fizzy soda pop before entering the ice cream vault to start our bubbly, sweet adventure. We soon entered Marye's Diner, which was designed after a 1950's-style diner, complete with a long counter, stools, a jukebox, and records lining the wall. MOIC serves a rotation of ice cream flavors from local partners, including Bi-Rite, CREAM, Salt & Straw, and It's It in SF. The scoop of the month in Marye's Diner when I attended was Bi-Rite's exclusive strawberry snap sundae, with strawberry balsamic glaze and ginger crumbles. Talk about yum! When entering this room, I felt like I was transported into a candy land filled with bright lollipops, macarons, gummy bears, and pinwheels in every corner of the room. 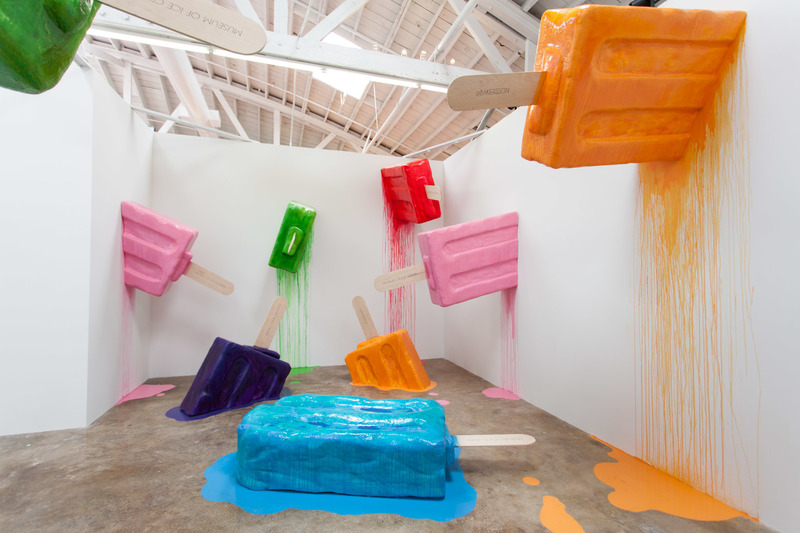 I remember seeing a photo of the Popsicle Room at the MOIC in LA, and hoping that the creators would build a similar room at the SF location. And they didn't disappoint! The push pop room is decorated with ice cream bar wallpaper and filled with giant pink and orange push pops. This room even has a Boomerang-style photo booth to snap fun GIFs and email to yourself. This walls in this room were designed to look like one big fridge surface, with pink alphabet magnets covering the room from floor to ceiling. As we exited, they served us our mochi ice cream of choice, after Thy and I passed a BFF test where we guessed each other's favorite mochi ice cream flavor. This was a really neat room designed with rock candy covering the walls to form a mini candy cave. As we exited the cave, we were each given pop rocks candy to take home! We entered this baby pink room before entering the cherry raindrops and cotton candy clouds room. The friendly staff person dressed in baby pink served us cherry-flavored cotton candy dusted with glitter. She called it fairy dust. It was such a yummy treat! This was one of my favorite rooms. It was so bright and merry, and I loved the whole concept of cherries and cotton candy replicating raindrops and clouds. This room is fairly simple with the floors covered in silvery glitter and notches of prism crystals on the walls. With the clever lighting, this room shines with subtle and beautiful prism rainbows. I loved the unicorn rainbow room! They started us with a sweet treat, which the staff member called 'unicorn ice cream dipped in magic'. We had so much fun snapping photos with the white unicorn statue. The sprinkles pool was easily my favorite spot at the MOIC. There's something about diving right into a pool of sprinkles and not having a care in the world as you throw sprinkles around everywhere, that makes you feel like such a kid again. When we were there, they had a synchronized 'swimming' ballet performance. It was so silly and fun to watch! These swings were so much fun to play on. It made me think of my childhood years where I spent so much of my time outdoors on the playground, swinging for hours on the swings. This was the last set of rooms at the MOIC and I seriously didn't want to leave! At the end of our adventure, we entered the ice cream & souvenir shop. They served exclusive ice cream flavors here, such as 'pinata' and 'sprinkles pool'. The souvenir shop had a fun array of items related to ice cream and treats. With such a unique museum concept involving one of my favorite treats of all time, I do think the $38 ticket price is worth the adventure that awaits you at this magical place. We all had such a fantastic time and enjoyed every single room at the photo-friendly MOIC. We ended the night consuming yummy hors d'oeuvres and drinks, and celebrating with the rest of the guests!